Hello, my name is Jason Rawlings and I am a final year PhD student at UCL’s Mullard Space Science Laboratory (MSSL). I am part of the astrophysics group here at MSSL and in this post I will describe the final year experiences of a Ph.D. student at MSSL. MSSL is the UK’s largest university space research group. 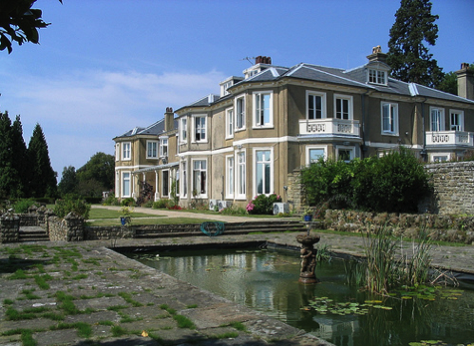 The lab resides in the Surrey hills and started life as Holmbury House, built in the 1870’s. The building was transformed into a space lab in the late 1960’s. A couple of shots of MSSL and its environment. There are many different groups here at the lab, including instrumentation, cryogenics, plasma, planetary, solar and astrophysics. In the astrophysics group, we have a wide range of research topics that include simulations of spiral galaxies, galaxy formation and evolution, X-ray binaries, high-redshift active galactic nuclei and dark matter and dark energy. With MSSL not being located in London along with the rest of the University, being a student at the lab is a different experience to most Ph.D. students. There are about 30 students here in total and with everyone knowing everyone; this creates a close community atmosphere. Students at MSSL have the opportunity to present their work to each other in a more relaxing environment, without the presence of supervisors or other senior staff, while students in the astrophysics group attend the weekly seminars given by experts in the astronomy field. Outside academia, there are plenty of social activities for students to take part in, with visiting the many local pubs being a particular favourite. Many students also have the opportunity to live in on-site accommodation. 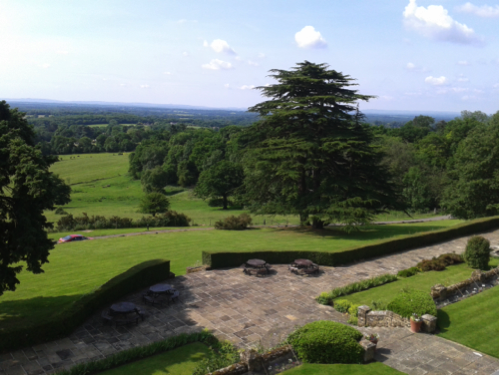 An added feature of working at MSSL is that we are treated to a picturesque view of the natural surroundings. The view of the surrounding Surrey countryside from my office. As part of the final year of a Ph.D. comes the daunting task of writing your thesis. To describe and condense the work you’ve done in the last 3-4 years is no easy challenge and perseverance is definitely a quality that’s needed in a finishing Ph.D. student. A thesis is broken down into different chapters, with at least three of these presenting original research by the student. Each of these should describe a different project undertaken during the Ph.D. It can help if some of your work has been published in a peer-reviewed journal as this can form the basis of a research chapter. There is a definite learning-curve when doing a Ph.D. and thankfully a lot of progress can be made in the final 12 months when one fully gets to grips with the field they study. My interests are in infrared and radio extragalactic astronomy and the research presented in my thesis investigates the emission of photons from the formation of stars on a large scale and from active galactic nuclei (AGN)- accreting massive black holes at the centre of all galaxies (see one of our previous blogs here for more information on AGN and star formation). Both processes can emit the photons at the same wavelength and so when observing a particular galaxy, the emission can get mixed in together making it hard to tell which process is the most powerful. Fortunately, we have models that describe how the emission from each process changes with wavelength. By adding these models together and changing their relative strengths, it is possible to create various composite models. These models can then be compared to observational data. From the composite model that agrees with the data the most and the individual model with the greatest strength, one can infer which process is dominating the emission. This is a useful technique and one that I employ in my thesis for different samples of extragalactic radio sources- galaxies with powerful radio emission. The work during my Ph.D. has shown that radio sources with an AGN can have a strong component from star formation which means that they are producing stars at an exceptional rate. In our first science blog post, we discussed Gamma-Ray Bursts (GRBs) and the research carried out on these extreme cosmic explosions here at MSSL, thanks to our involvement in the Swift satellite mission. I am Dr Massimiliano De Pasquale, a Research Associate at the Mullard Space Science Laboratory. I would like to talk to you about one of these spectacular cosmic events recently studied by Swift. On April 27th, 2013, Swift detected an exceptionally bright burst, ”GRB130427A”, named after the date it occurred. The Burst Alert Telescope (BAT) instrument onboard Swift detected a fluence (energy units divided by surface units) of 6.5e-4 erg cm-2 for this source. Of the 700 GRBs discovered by Swift so far, this is the highest fluence detected. Swift is not the only facility which detected GRB130427. Other space borne satellites, such as INTEGRAL, Konus-Wind, Fermi, also observed this spectacular event. The detectors onboard these satellites have a wide ‘energy range’. Swift BAT can detect photons only if their energy is between 15 and 350 keV, while Konus-Wind instruments detect photons between 20 and 20,000 keV, and Fermi instruments can detect photons of energy between 8 and 300,000,000 keV (300 GeV). Thanks to measurements provided by these missions, we know the electromagnetic emission of GRB130427A in fantastic detail. GRB130427A gamma-ray fluence is 0.0027 erg cm-2 (20-10000 keV; Konus-Wind measurement); since observations of these sources begun in the late 60’s there has only been one GRB, GRB 840304, with confirmed higher fluence. 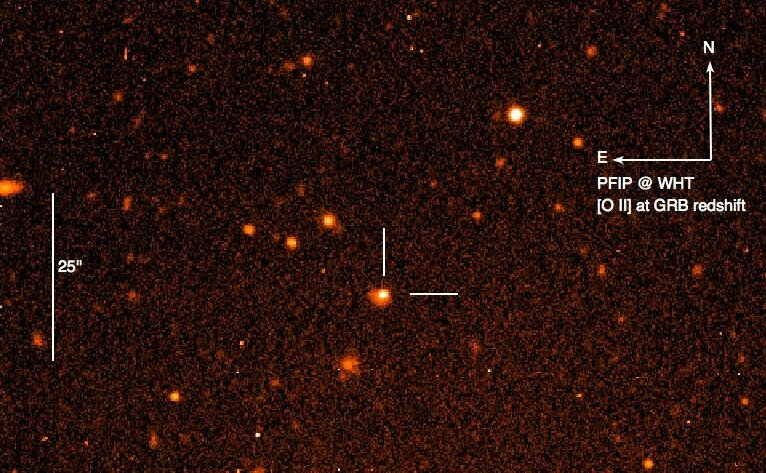 Fermi detected photons coming from GRB130427A for which the energy is in the millions of keV. In particular, it found the highest energy photon ever detected from a GRB, 95 million keV. The energy of such a photon is 40 billion times higher than that of the typical photons of sunlight. Furthermore, these extremely energetic photons were detected for almost 1 day, while they are usually observed only for 1 hour or less in the other few GRBs that present such ultra-energetic emission. Once Swift detected this exceptional burst, it started slewing in order to place the event within the field of view of its X-ray and UV/Optical telescope, XRT and UVOT respectively. Within 2 minutes of the trigger, XRT and UVOT were already observing GRB130427 in the X-ray and optical bands. At the same time, Swift beamed the position of the source to telescopes and other ground facilities, which could repoint and start observing this GRB. XRT detected one of the brightest X-ray sources ever found at the position of the GRB, the so called ‘afterglow’. UVOT also detected a bright source, the optical counterpart of the afterglow, shining at 11th magnitude (at this magnitude it could have been seen even by amateur telescopes, if pointed at the right position within the first ~200s). At the same time, several ground radio, infrared and optical observatories detected the source and started to take measurements in matter of minutes. We thus have fantastic measurements of the electromagnetic emission of GRB130427A, ranging from the radio (10-8 keV) to very high energy emission (108 keV): 16 decades of energy. And while the declining optical and X-ray afterglow emissions of typical GRBs are usually visible for a few days, sometimes a couple of weeks, after the trigger before fading below the threshold sensitivity of the instruments, for GRB130427, the very bright X-ray and optical afterglows are still detected 6 weeks after the trigger. About a day after the trigger, the RAPTOR team reported that the three of their wide-field telescopes, which monitor the full sky, detected an optical source at the position of the GRB roughly at the beginning of the gamma-ray emission. Such source brightened up to magnitude 7.4, enough to be visible with common binoculars. Then it faded to magnitude 10-11, when it was detected by UVOT. Spectral analysis of the optical emission showed the signature of chemical elements at certain wavelengths (see also the post by Ignacio Ferreras). Such signatures, called “absorption lines” and due to chemical elements absorbing light, enabled us to determine the distance of the event. In fact, the wavelengths of these signatures are not the same as those measured on Earth, but they are larger. Since the red colour is associated with large wavelengths, this phenomenon is called “redshift“. Its origin is the expansion of the Universe: the wavelengths of the electromagnetic radiation is “stretched”. The amount of redshift is linked to the distance of the emitter and the age when the emission was first produced. The absorption lines in the spectra of GRB130427 were at wavelengths 1.34 times larger than those measured on Earth, which corresponds to a redshift of 0.34. From such measurement, we know that GRB130427 occurred 4 billion years ago. Knowing the distance, we also can compute how many cm2 there on the surface of the sphere centered on this GRB, and we also know that each one of these cm2 was crossed by 0.0027 erg of energy. As a result, we can calculate the total amount of gamma-ray energy produced by the GRB, which sums up to the astonishing value of 1054 erg. GRB130427A dissipated in a few hundreds seconds 1000 times the energy our Sun will produce within its 10-billion years lifespan. We can also determine what brightness it would have had if placed at the same distance of the brightest star in the sky, Sirius. It would have shone with a magnitude of -36, about 5000 times brighter than the Sun. The average GRB produces “only” 1052, 1053 erg of energy, and is located at redshift 2-3. Events that unleash 1054 erg are rare, and their occurrence is even rarer at such “low redshift” from us. It has been calculated that it might take several decades before another GRB like 130427A takes place again. GRB130427A is unprecedented for another reason. So far, GRBs at low redshift were the most common, ‘weak’ events which produce only ~1051 erg or less. When such bursts are observed for a long time in the optical, the signature of a supernova is detected. Such a supernova flags a link between GRBs and the deaths of very massive stars; however, such a link could be safely established only for these weak events. GRB130427 is a 1054 erg behemoth; nobody knew for sure whether a supernova was associated with such events. If no supernova had been found, the current paradigm of the association between GRBs and massive stars would have been deeply shaken. In recent weeks, very big telescopes all over the world took measurements of the optical emission of the afterglow, waiting impatiently to spot the supernova emission. Eventually, the Spanish 10.4-m GTC telescope detected the signature of the supernova in the light of GRB130427A on the night of May 13th. 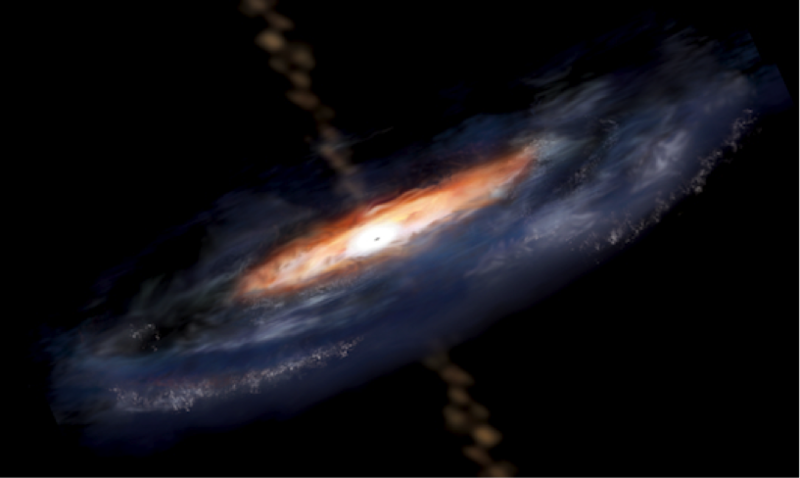 GRB130427 represents an unparalleled opportunity to deeply study one of Nature’s biggest explosions so close to us. It is a rare combination of very high energy output and closeness. Such an event will be actively studied for years to come and will produce a plethora of papers in the most important scientific journals worldwide. At MSSL we are greatly contributing to this research and efforts, thanks to the analysis of optical data provided by UVOT as well as to the theoretical interpretation of the observations, and we shall be co-authors of forthcoming scientific works on this outstanding GRB.